If Saturday’s win over Livi taught us one thing, it was the worrying status of Kyle Lafferty. Fans have been regularly asking us here on the site why he wasn’t playing, and his big chance at the weekend more than alluded to part of the reason. Regulars will know we have a lot of time for The Bold Kyle – we were absolutely delighted by his signing and his status as the best SPL striker outwith the Old Firm (and maybe even including) was not in doubt during his peak Hearts days. He was also very decent for us first time round too, despite then-assistant Ally McCoist admitting we’d been a bit unfair on him by deploying him as a winger rather than his natural striker position – his preference is most definitely central. 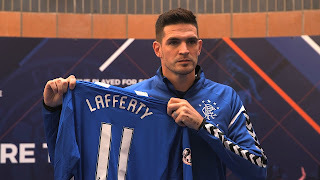 But despite a few readers mocking our (sadly justified) criticism of his displays by suggesting his impact was clear (they actually said that) it’s become more evident over time that whatever has stopped Lafferty from being at his best remains a problem and his performance at the weekend was mediocre at best and poor at worst. We hate saying all this because he’s one of us and no one could ever accuse the lad of not wanting the best for Rangers (admitted he’s happy to not play as long as we win) or of not putting in effort when he does. His heart, on and off the pitch, when it comes to Rangers, is definitely in the right place. So in no way is this article being published lightly – but the hard reality is, so far, Kyle Lafferty hasn’t produced since he came back at all. He’s got a few goals, yes, but there does seem to be a reason, more than just Morelos’ form, as to why Lafferty is in and out (mostly out) of the side. That said, Morelos’ impact at the weekend rather highlighted just what difference he can offer over the Northern Irishman right now, and we discussed earlier about picking your best players when you can. Perhaps the system isn’t suiting Lafferty, perhaps he needs a foil up front, but then he’s actually struggled for his country too for two years (hasn’t scored since netting v Azerbaijan in 2016) so maybe there’s more than the system. Whatever is going on with Kyle Lafferty, and we know the boy has a lot of off-pitch issues right now, we hope he gets the help he needs to overcome them and we start to see the best of him on the pitch. We want the Kyle Lafferty we know, and we’re sure he does too. Hoping Kyle Comes Good cause He is a Goalscorer! Not to say i told you so but .... well i did. He has been absolutely horrific for us (Norn Iron) for well over 2 years, no heart no desire, first touch like a baby elephant, constantly trying (and failing) things that Ronaldo wouldnt even think about ffs. We're gonna be stuck paying this waster (and judas) til the end of his contract with feck all in return. While im tooting my own horn, i also said GMac would be the rock we needed at the back and im begging for the signing of Stevie Davis both are indespensible for country even at their age and can be for the Gers. Nope not pulling his weight to much of a passenger for me and talking of passengers is it true we have Pena the wiper of his nose on our famous teams shorts coming back with Herrera I hope I'm strong with this one because WATP. Nothing complicated here. He just isn't getting enough game time. Even Ronaldo and Messi would find it hard to score from the back row of the Rangers dug out. Though actually if you look at his scoring record first time around, or elsewhere for that matter, it wasn't really that impressive so I'm not sure what people were expecting. You can't blame people for wanting Morelos let go, last season. He was shite. He's improved and i'm chuffed, but he could have just as well 'stayed' being as poor as he was. Who was to know SG, would be so good at man-management? Point is, what's best for the club comes first. Individual players, second. I hope Lafferty does come good. But all I see atm, is that last season for Hearts, he was a goal-machine, comes to Rangers... You get my point. The club can't afford to be 'carrying' loads of crocks who are not contributing, to the mission. That's just bad business. There's no place, for personal feelings, about players, if we are to get back on top. Tough decisions need to be made. Harsh maybe, but the club's rise to our rightful place, is what 'should' be coming first. Individual players, second. Joe do your homework before you post. Lafftery scored 16 goals for Hearts last season which is hardly a goal machine. Meanwhile Morelos who you say "was shite" last season scored 18 goals. Incidentally that was 6 more (domestically) than Dembele who was sold by Ceptic for £20m.